Casa Lastra is a charming house from 1909 restored from the restoration of its original materials that will connect you to the magic of the first port and cultural capital of the country, located in the plan of Valparaiso, at the foot of Cerro Mariposa. The hostel is a meeting point for local producers who provide services for the life of the traveler harbor life experience. 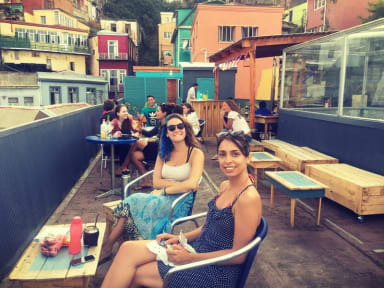 Casa Lastra Hostel is located in the city of Valparaíso that belongs to the V region of Chile. The hostel is located in the center of the city at the foot of Cerro Mariposa. Close to restaurants, shops, bus station, metro and sea. Apart from the details mentioned before, from our position you an reach easily some of the finest attractions of the city such as Museo Cielo Abierto, Museo de Historia Natural de Valparaíso and Plaza Del Pueblo Salvador Allende, amongst other interesting spots of the city. We offer several types of accommodation to suit the needs and wishes of diverse sort of guests and travellers. In this sense we have dorms with several capacities fully equipped to ensure a great stay as well as private rooms with different capacities to guarantee a relax and tranquil stay. In addition, our facilities comprises the following services amenities: Free WIFI, Cable TV, 24 hours reception, Towels (private rooms), Breakfast included, Free Maps. Our breakfast is part of the alliance we have with the Emporio Herrera Chiguay, which offer handmade products and local producers. voto basso solo.per cucina e colazione abbastanza scomodi e scarsi. Bellissima però la terrazza superiore. Zona non comodissima ma abbastanza vicina alle attrazioni.